In this activity, you will connect their prior understanding of coordinate space to the green Spaceland of StarLogo Nova. The coordinate system of Spaceland is 101 patches in the x-dimension by 101 patches in the y-dimension with (0,0) in the center. You will practice placing their turtles in specific quadrants of Spaceland using set traits block called ‘set my…’ You will then use the ‘set my heading to’ block to explore having turtles move in specific directions in Spaceland. These commands will be used to make the water molecules move as if responding to gravity. Review coordinates on a graph; connect coordinate system to Spaceland. Create turtles in different quadrants of Spaceland and use new blocks to make turtles move in a specific direction. 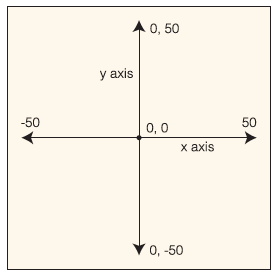 Review X and Y axes as horizontal and vertical and review where (0,0) is in Spaceland. Create turtles in different quadrants of Spaceland and add new blocks to have the turtles move in a specific direction. Add code to the ‘when setup pushed’ block. First you must clear everything that was there before and then add a turtle with specific X and Y coordinates. 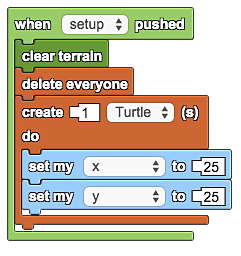 Next, add to the setup code by adding 3 more ‘create 1 turtle’ with new X and Y coordinates. You should be able to put a turtle in each of the 4 quadrants using the ‘set my’ blocks. Now use the ‘when forever toggled’ block to get your turtles moving in a specific direction on Spaceland. The directions follow 360 degrees like a protractor. Get your turtles to all move towards the top of Spaceland. What challenges did you encounter with positioning and moving your turtles? Post your reflection in your portfolio in the section "Reflections->Computer Modeling and Simulation".